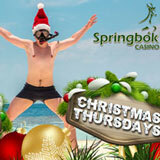 This month South Africa’s Springbok Casino is celebrating Christmas every Thursday with double comp points on all Christmas slots plus some extra free spins and casino bonuses that players will hear about through email. there will be Every Thursday in December is a at . Players will get double Comp Points when they play Christmas slot games and they’ll receive coupons for free spins and deposit bonus offers by email. During the Christmas Thursdays everyone will earn double Comp Points playing holiday slot games: the Return of the Rudolph, Santa Strikes Back, Rudolphs Revenge, The Elf Wars, Naughty or Nice and the brand new The Naughty List. Comp points can be redeemed for cash. Remember the The Naughty Girl and Nice Girl in the Naughty or Nice slot game? Well, they're back in Realtime Gaming's new The Naughty List. It's a 50 pay line video slot that has two bonus features. One is a Pick game where you choose presents from under a Christmas tree to reveal prizes to win bet multipliers up to 10X. If you're registered at Springbok Casino you'll be getting emails telling you about additional free spins and casino bonus offers every Thursday. Springbok Casino has hundreds of games from Realtime Gaming. 20 of its best games are also in its mobile casino for smartphones and tablets. It's the only online casino where the default currency is the South African Rand.